I like my iPhone. It's my alarm clock, email machine, language instructor, blog reader, and Facebook stalking device. I not only use it all the time, but I rely on my iPhone to help me find good restaurants, book airline flights, and prove that I'm right with a quick Internet search when I have a bet with friends. But I no longer rely on my iPhone to help me navigate around town -- this town or any other. Apple's decision to ditch Google maps and substitute its own mapping system would be funny, if it wasn't for the fact that maps are supposed to find places for you, not get you lost. Apple's maps don't know where Dulles Airport and the Kennedy Center are; the Washington Monument's location isn't even close (the earthquake shook things up, but it didn't move the monument); it doesn't know the capital of Israel; directions to a hospital in Florida bring you to a supermarket; Stratford Upon Avon isn't to be found anywhere in England -- or the world. If you use an Android phone with Google maps built in, please don't gloat. We can help Apple make their maps better by reporting map errors to Apple. Let's do this: We can make Washington, DC error-free. 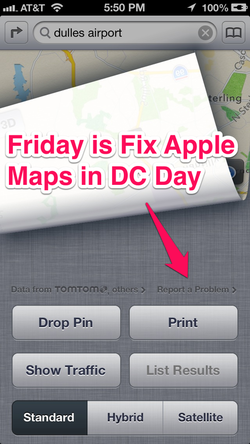 This Friday, October 12, is Fix Apple Maps in DC Day. On Friday everyone who has an iPhone should correct every single map problem we see. Let's deluge Apple with good information. We may not be able to change the world, but we can certainly change Apple's Washington, DC area map data. To report a problem, flick the map page up, using the curled corner on the lower right. In light gray type you'll see "Report a Problem." Tap "Report a Problem" and let Apple know how things really are. You can do this every time you spot a map error (unless your fingers tire first), but let's all make a special effort to do it on Friday, Fix Apple Maps in DC Day. Tourists will thank us. Uber drivers will thank us. People late for job interviews will thank us. We'll thank each other. This Friday, on Fix Apple Maps in DC Day, relentlessly report every problem you see to the mother ship.